By Siemens. Size 57. Manufactured in a flecked brown reed linen cloth with a green satin lining and lambswool inner 'earpieces'. 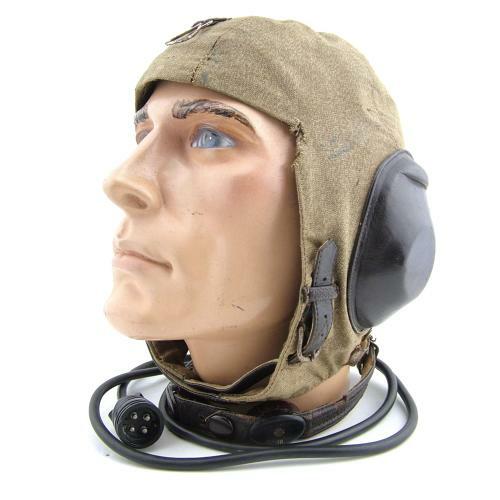 This example has the usual brown leather covered earphones and is fitted with hooks/strap for a three-strap oxygen mask. Fully wired with LHB 1 (Mi 4b) magnetic throat microphones, loom and four-pole break coupling. It also fitted with receivers and retains both of the plastic soundboards. The cloth is in good overall condition but does have some fraying and small repairs at the temples/forehead (see photographs). There is also a small hole at the rear of the helmet where the wiring loom is attached. All straps and buckles are very good although some of the metal components have minor surface corrosion. The lining is generally good bar some light fraying. Nice clear label. The avionics are generally very good apart from some wear on the throatmicrophone straps and one missing press stud. A reasonaby good used example that displays well. Further photographs available on request. Stock code H23337.